I admit that I haven't been on the Food Network website in a LONG time, but I was reunited recently while looking up brunch recipes (more to come later! ), and I saw a collection of quick spring family meals. One of the first recipes was this pasta toss and it was perfect. Not too much lemon, so Rob won't be able to complain too much. And quick and easy, which is always a bonus! I did omit the capers, as I really dislike them, but adding them really will make this more like a chicken piccata dish. Heat a large skillet and half of the olive oil over medium high heat. Season chicken with S&P and add to heated pan. Brown until lightly golden, about 5-6 minutes, tossing occasionally. Remove from pan and set aside. Reduce heat to medium and add the rest of the oil and 1/2 tablespoon of butter. Toss in garlic and shallots and saute for about 2 minutes. Add flour and cook another 1-2 minutes. Whisk in wine and reduce about 1 minute then whisk in lemon juice and broth to make a sauce. Stir in caper and parsley. Once the sauce starts to slightly bubble add last of the butter. Add chicken back to sauce, including any juices left on the plate, and gently heat back up. 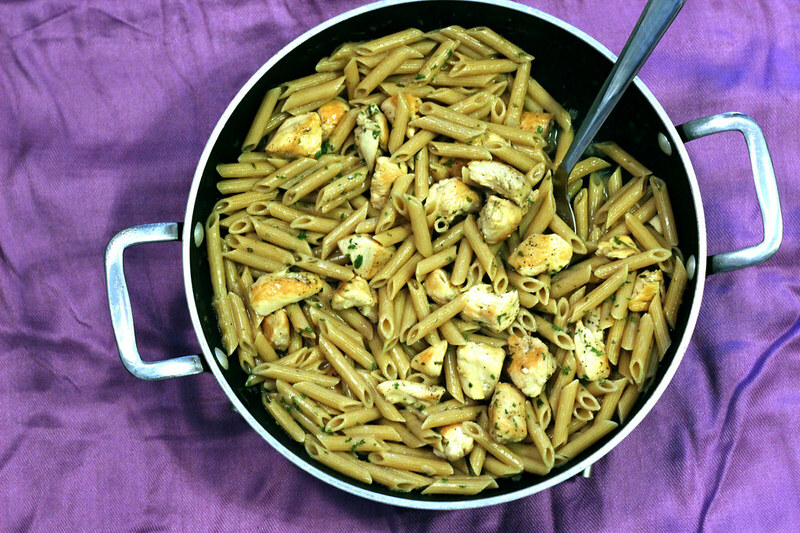 Toss the hot pasta with the chicken and sauce and serve. Garnish as desired.